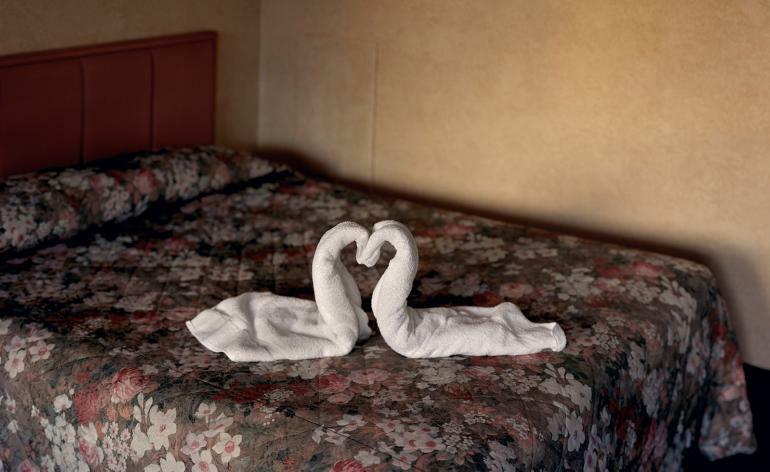 Eschewing the linear narrative of his previous annals of Middle America, photographer Alec Soth’s new body of work unfurls like a compilation of poetry about people and their personal spaces. Presented in the book I Know How Furiously Your Heart is Beating (as well as four concurrent exhibitions in San Francisco, New York, Berlin and his native Minneapolis), the series at times focuses on the people themselves, but in many images their surroundings take centre stage. After all, our homes often reveal more about our innermost selves than our clothing or faces. ‘All of my work in the past has been about place to some extent, and I didn’t want that to define this work,’ Soth says when we meet at Berlin’s Loock Galerie the day after his exhibition opening. ‘I wanted to define it as this engagement in a space – that simple.’ This shift in his approach resulted from a kind of transcendental experience or reawakening that followed a deep meditation during a flight to Helsinki in 2015. In an image like Leon, Berlin (2018), we see a man wearing only white underwear as he gazes out a window, his back reflected in a wall-covering mirror. The room itself is starkly white and empty, save for a blue exercise gadget and wigs scattered in a small circle. In further images, the picture frame is filled entirely by unending stacks of old books or a stuffed owl, wings spread, hanging above a bedroom door in Bucharest. We’re taken from Los Angeles to Salt Lake City and Cincinnati, from Warsaw to Bucharest and Giurgiu. The places and people may seem random, but we gain an intimate sense about the life they might life, yet one that’s open enough for us to create our own stories. And that’s exactly the point.